If you enabled two-factor authentication, you can sign in to any Yandex service or app using a one-time password. If you added several accounts to Yandex.Key, don't forget to switch to the correct account before entering your PIN code. 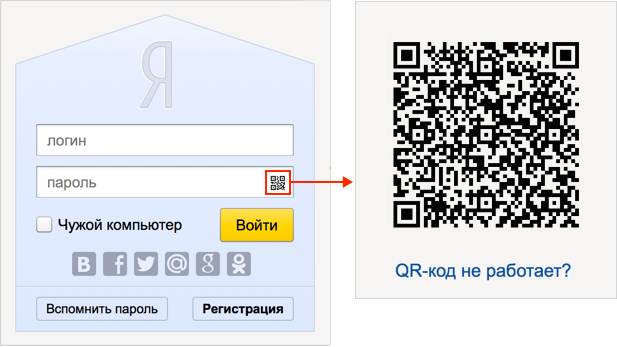 You can also sign in to many Yandex web services using a QR code. Attention. You can only use one-time passwords to log in to apps developed by Yandex; app passwords will not work, even if they are generated correctly. You can enter a one-time password into any Yandex sign-in form or use it to log in to apps developed by Yandex. You need to enter the one-time password before it stops displaying on the app screen. If there isn't much time left until the next password, simply wait for the new one to appear. To get a one-time password, launch Yandex.Key and enter the PIN code that you created when setting up 2FA. The app will start generating passwords every 30 seconds. You can copy your current password from Yandex.Key into another app. To do this, click next to your password. It makes no sense to save one-time passwords in your browser or anywhere else. Even if you don't use a password immediately, it'll stop working very soon. Yandex.Key will not verify that the PIN code you enter is correct: it will generate one-time passwords even if you've entered your PIN code incorrectly. In this case though, your generated password will also be incorrect and you will not be able to sign in with it. To enter the correct PIN code, you just have to exit the app and launch it again. Some services (such as the Yandex homepage, Passport, or Mail) allow you to sign in to Yandex by simply pointing your camera at a QR-code. Your mobile device must be connected to the internet so that Yandex.Key can communicate with the authentication server. Click on the QR-code icon in the browser. If there is no QR icon in the login form, it means that you can only log in to this service with a password. In this case you can sign in to Passport with a QR code, and then go to the service you want. Enter your PIN code in Yandex.Key and tap Log in with QR-code. Point your device's camera at the QR-code which is displayed in your browser. Yandex.Key detects the QR-code and sends your username and one-time password to Yandex.Passport. If they pass verification, you will be automatically signed in on your browser. If the password sent turns out to be incorrect (for example, as a result of entering the wrong PIN code in Yandex.Key), then the browser will display the standard error message that you entered an incorrect password. Apps or sites that need to access your Yandex data sometimes ask you to enter your password to log in to your account. In these situations one-time passwords will not work; you will need to create a separate app password for each app of this type. Attention. Yandex apps and services only work using one-time passwords. Even if you create an app password for a service like Yandex.Disk, you will not be able to log in using it. You can transfer the generation of one-time passwords to another device or configure Yandex.Key on multiple devices at the same time. To do this, open the Access control page and click Switch device. The same Yandex.Key app can be used for multiple accounts that use one-time passwords. To add another account to the app while setting up one-time passwords, click in the app during step 3. You can also have Yandex.Key generate passwords for other services that support two-factor authentication. Instructions for most popular services can be found on the Generate verification codes for non-Yandex services page. 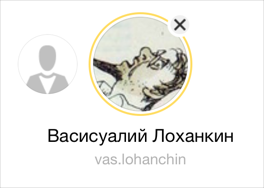 To remove an account from Yandex.Key, tap and hold the corresponding portrait in the app until a cross icon appears to the right of it. When you tap on the cross, that account will no longer be linked to Yandex.Key. Attention. If you delete an account which had one-time passwords enabled, you will not be able to get one-time passwords to log in to Yandex. In this case, you will have to restore access. You can bypass the fingerprint scan on iOS smartphones and tablets, however, by entering the device's password. To prevent this from happening, set up a master password or make your password more complex. Just open the app Settings and select Touch ID and password. Select the account you need. Enable Fingerprint (for Android) or Touch ID (for iOS). Create a master password to further protect your one-time passwords: → Master password. save your Yandex account PIN code in the app so that you don't have to enter it every time you need a new one-time password. You can create a backup copy of your Yandex.Key data on a Yandex server so that you can restore it if you lose the phone or tablet that you installed the app on. Data from all the accounts that you had on Yandex.Key when you did the backup is copied to the server. It's not possible to create more than one backup copy; each subsequent copy of data for a specific phone number will replace any previous ones. Attention. The backup copy only contains usernames and the "secrets" that are necessary to generate one-time passwords. You must remember the PIN code that you entered when you enabled one-time passwords on Yandex. At the moment, it is not possible to delete a backup copy from the Yandex server. It will be deleted automatically if you do not use it for one year after creating it. Select Create a backup copy in the app settings. Enter the phone number that the backup copy will be linked to (for example, “1234567890”) and click Next. Yandex will send a confirmation code to this address. As soon as you receive the code, enter it in the app. Think up a password for encrypting the backup copy of your data. You can't restore this password, so make sure that you don't forget or lose it. Enter the password you want to use twice and then click Done. Yandex.Key encrypts the backup copy and informs you when it gets sent to the Yandex server. Select Restore access from your backup copy in the app settings. Enter the phone number that you used when creating the backup copy (for example, “1234567890”) and click Next. If a backup copy of that Yandex.Key data is found for the number you enter, Yandex will send a confirmation code to that number. As soon as you receive the code, enter it in the app. Make sure that the date and time when the backup copy was created and device name match the backup copy you want to use. Then click Restore. Enter the password you entered when you created the backup copy. If you don't remember it, you can't unencrypt your backup copy, unfortunately. Yandex.Key will unencrypt your backup copy and let you know that your data was restored. Yandex.Key takes into account the current time and time zone set on your device when it generates one-time passwords. When an internet connection is available, the app also requests the exact time from the server. If the device's time is set incorrectly, then the app will correct it. Please note that in some situations, even after the app makes a correction and the correct PIN code is entered, the one-time password will be incorrect. Make sure that you have the correct time and time zone set on your device. Then try logging in with a new one-time password. Connect to the internet so that Yandex.Key can get the correct time itself. Then restart the app and try entering your new one-time password. If the problem still doesn't resolve, please use the form below to the Support Dept.